Welcome to Historical 30th & Fern. Located in the heart of San Diego’s South Park neighborhood, the recently restored historical building complex is home to unique businesses. With its variety of stores and services, Historical 30th & Fern is a destination in and of itself. Spend the day here. Buy a cool sofa for your home; have a hair-cut; discover the latest creations from indie artists; exercise before enjoying a (guilt free) beer, or a glass of wine; check if your investment strategy is still aligned with your objectives; look at residential real estate opportunities… the possibilities are many. 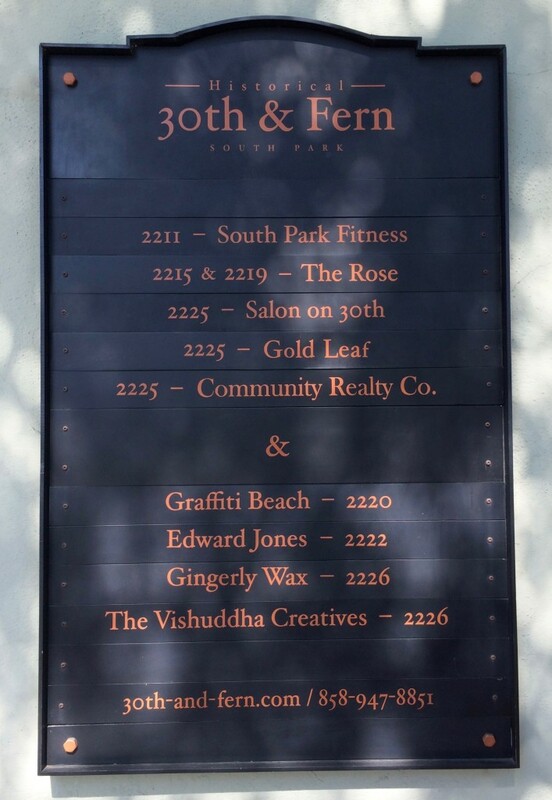 The entire South Park neighborhood is a well-kept secret, even from San Diegans! Take a stroll on the side streets as well; you’ll travel back in time. You’ll see a wealth of old restored homes: traditional California bungalows and Spanish style alike. South Park is proud of its heritage and it shows. Urban hipsters and families have made it their home. Come and enjoy!